The Bira Race Circuit has an endurance round this weekend, rather than the sprint events so far all year. Over 50 drivers have signed up for the event, which is for touring cars (Group N) and run in two classes - Under 1600 cc and 1601-2000 cc. The event isn’t quite the Le Mans 24 hour, but the two hour event is a start at getting some endurance rounds going in this country. Who knows, one day we might even get our own 24 hour race? They have these endurance events all over the world and they attract much media attention. The latest is a 24 hour for touring cars around the famous Bathurst circuit in Australia. Back to our local event. There has to be two drivers for each car, but the driver who starts has to be the driver who also takes the chequered flag at the end - a novel twist! There will also be a need to refuel, so the pit crews are going to be busy. One factor often overlooked by teams is that the drivers should ideally be around the same size. Many of the race car seats are bolted in and are not adjustable. 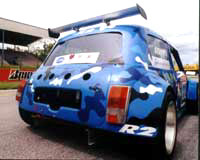 Another novel feature is an event for the car clubs that have been guests at the AIM Racing Project meetings this year. Drivers will be given an intensive training course on the Saturday and then let loose for a ten lapper on the Sunday. I predict lots of bent machinery! The winner will be called the King of Clubs! Organizers are also expecting a ‘mini’ marathon with around 20 Mini’s taking part. The Bira Circuit is around Km 14 on Highway 36 leading to Rayong, and between the Regent’s School and the Highway 331 flyover. Action begins at 10 a.m. on the Sunday morning 7th December. Yes, we get the VW Passat in Thailand, but no, we do not get this model, which our Down-Under correspondent John Weinthal describes as a VW flagship in Australia - and one with a unique engine. The biggest engine for Thailand is the 2.3 V5, which pushes the Passat to just under 2 million baht. “Its nameplate goes some way to explaining what this car is all about - VW Passat W8 4Motion. These days the letters VW undoubtedly spell build quality, no matter which product one is considering. I rate Volkswagen - together with its Audi kin - alongside Lexus at the very pinnacle in this sphere. “The name Passat is familiar enough for VW’s medium-luxury sedan range - restrained style, neither over the top nor gimmicky in its equipment; cars that get about their business in a purposeful dignified manner. “4Motion is the German company’s designation for constant four-wheel-drive. We have reviewed it previously in the AUD 65,000 V6 Passat and the smaller, sporting and hugely appealing 55 grand 150kW V6 Bora. “That leaves the W8 part of the test car’s lengthy name. It refers to the engine of course. VW describes this as being like two 15 degree V4s fused together with staggered cylinder bores. It is offset 72 degrees. This enables this 4 litre eight cylinder unit which develops an impressive 202kW of power and 370 Nm of torque to sit comfortably, albeit tightly, in the regular Passat engine bay. “While the Passat is compact in size it is no lightweight at 1787 kg. This is some 90 kg more than a Ford Falcon and more than 200kg up on the Holden Commodore (Chevrolet Lumina in Thailand). “However, the Passat W8 is no slouch. It can cover the 0-100 sprint with a delicious growl from the twin exhausts in under 8 seconds. It will surge on to an artificially stifled top speed of 250 kph - although the inclusion of a 300kph speedo more than strains credibility. “In fact, all the instruments are difficult to read by day or night with red needles pointers on black analogue dials and black on grey digitals by day. At night there’s a confusion of misty blue and dayglo red information sources. “Standard items include brilliant bi-xenon headlamps, useful parking distance control, a chillable glove box and a solar sunroof which maintains an in-car temperature of 20 degrees when it is parked. The driver has a three-memory eight-way power adjustable seat. The W8 rides on 45 profile tyres on chunky 17x7 inch alloy wheels which have anti-theft bolts. “There are well-shaped but firmish leather seats plus most of the usual goodies. There is a single disc CD player in the fascia and a six-stacker in the boot. The in-dash CD player cannot be used at the same time as the Satellite Navigation which has the least informative and smallest screen encountered to date, mounted well beyond the driver’s normal vision. “The transmission is a five-sped auto with Steptronic control. VW’s 4Motion system incorporates a Torsen differential and four electronic diff locks. “Safety features include six airbags, anti-lock brakes with brake assist and brake pressure distribution and electronic stability control in addition plus the reassurance of constant all-wheel-drive. “For all this, the Passat W8 is not truly convincing as a 100 grand contender. The build quality is A1, but the ride is jiggly on less than good road surfaces. The handling constantly reminds one that this is a heavyweight in spite of its overall dimensions. Understeer rules, discouraging over-exertion on twisty roads. “The W8 engine is smooth and it sounds terrific. On our drive the Passat W8 was not unduly thirsty with a good range assured by an 82 litre fuel tank. Thank you John for your overview of the all wheel drive Passat. I wonder when (if) we’ll get it here? The annual COTY awards are coming through again, and it is interesting to see that what is tops in one area is not necessarily tops somewhere else. Take Japan for example. COTY was the Subaru Liberty (Legacy here) with 368 votes, making it a first ever for Subaru. Second was Toyota with the Prius Hybrid (322) and then the Mazda RX 8 with 238 votes. The first import was Jaguar with the XJ series with 60 and Audi’s A3 next with 55. On the other side of the world, the European COTY was a different story, with the new Fiat Panda coming out as the favourite with 281 from the 58 respondents from 22 countries. The Mazda3 was next (241) with the new VW Golf also on 241 and then the Toyota Avensis on 219. Last week I wrote about a couple of diesel engined Jeeps and asked who made them? The clue was it was not an American company, but they were called “Jeep” and that was embossed along the side of the engine cover. The answer was the Mitsubishi Jeep, models J54 and J24 which were powered by a 2.7 litre diesel engine. So to this week. Study this photograph. It was taken during a motor race in Europe. The two cars were from the same team, but the third car went on to win the race. Clues - look at the background, it will tell you the corner, the circuit and the race. Another clue, a car from the same team won the same race this year and had the same number as the winning car from the team in the photograph. What was the make of the car, and its nickname? Spotted a par in an on-line publication about Rich Schaum, a 57 year old ex Chrysler Executive Vice President for Product Development and Quality who resigned this year to take up a position with Wave Crest Laboratories in Detroit. He had become fascinated by the technology behind wheel hub motors for hybrid gasoline-electric cars. Hope he doesn’t think this is something new. We looked at this 101 year old technology in the Autotrivia column a few weeks back. It first came out in the 1902 Lohner-Porsche, designed by Dr. Porsche.